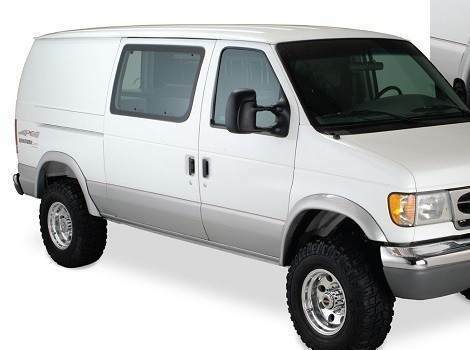 A Ford E-Series van is a popular choice for businesses, van campers and regular drivers alike. The high clearance and rugged construction means it will handle well both on and off the road. Tire treads pick up debris that is ultimately slung back against the van’s sides and fenders. The result is dents, missing paint and other places rust can damage the metal. Prevent damage by choosing and installing fender flares made to match the particular vehicle. Part Catalog has a wide variety of flares made for every Ford E-Series van as well as jeeps, trucks and other vehicles. Match the flare to the tire’s width and the harshest conditions the vehicle is required to navigate for best results. Many flares are paintable to match the vehicle’s colors and the owner’s style.